Like many of the festive customs we enjoy today, exchanging greetings cards with relatives, friends and neighbours originated over 170 years ago in Victorian Britain, at a time when early Christmas rituals like carols were being revived and new customs embraced. The first commercial Christmas card was introduced by Sir Henry Cole, a civil servant and inventor who had assisted Sir Rowland Hill with the launch of the Uniform Penny Post in January 1840. Previously, postage had been prohibitively expensive, but the pre-paid penny post was both efficient and affordable for the wider population and sending items through the post gained in popularity. On 1st May 1843, Cole commissioned the artist John Callcott Horsley to design a special card for people to send at Christmas. Horsley’s hand-coloured illustration portraying an affluent family enjoying a lavish meal and raising their wine glasses to the onlooker was reportedly controversial, considered irreligious by some; however, two runs of Horsley’s cards were printed, totalling 2,050, and all sold within that year at one shilling each. The Christmas card tradition was born. 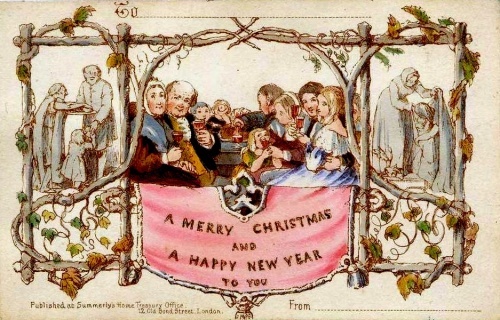 Early Victorian Christmas cards rarely represented religious or even wintry subjects, often favouring flowers, fairies and other picturesque imagery to remind the recipient of approaching spring, or humorous and sentimental scenes depicting children and animals. Robins soon began to appear on Christmas cards, as cheerful symbols of the red-coated Royal Mail postmen - nicknamed ‘robin redbreasts’ - who delivered them. Over time, more elaborate shapes, materials and decorations shaped the design of Christmas cards, although printed cards led the way. For Christmas 1873, the pioneering American lithograph company, Prang and Mayer, began creating greetings cards for the popular English market. The new chromolithography colour-printing process revolutionised the trade, high quality printed cards became more widely affordable and 11.5 million cards were produced in 1880 alone. Over time, some Christmas cards were beautifully embossed and highlighted in gold or silver, to stunning effect, while more evocative seasonal and religious themes extended the repertoire: glistening snowy landscapes; picturesque country churches with windows aglow; heavenly angels and cherubs lighting candles and bearing stars. Holly, ivy and mistletoe also became favoured emblems – native evergreen plants that traditionally enabled poorer families to adorn their homes during the bleak winter months. Rosy-cheeked children dressed in bright woollen coats, hats and hoods, pulling logs, sledging, ice-skating and making snowmen were also popular. Father Christmas or Saint Nicholas, a familiar festive figure from folklore, was portrayed variously in exotic blue, green or red garments - until the 1930s, when Haddon Sundblom, American commercial artist, illustrated St. Nicholas as a jolly, plump, white-bearded figure in a red, fur-trimmed suit for a Coca-Cola advertising campaign: so popular was his eye-catching design, oft-repeated in the following years, that Santa became permanently depicted in a scarlet suit. As the practice of card-giving soared, so too did the vogue for merry-making imagery representing feasting and drinking and festive scenes like coaches and horses pulling up at cosy country pubs. Many such seasonal images from the past are still familiar today, especially within the nostalgic vintage Christmas card genre, yet others have not stood the test of time. Peculiar, even nightmarish topics also featured on nineteenth-century Christmas cards, expressing the darker, more eccentric side of Victorian taste, from ghoulish snowmen and dying moths, to bizarre anthropomorphic frogs and cats, even sinister walking potatoes! 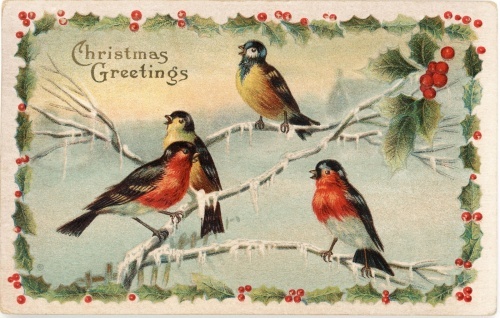 Eclectic, often extraordinary, there were apparently few themes that Christmas cards did not explore, either in high-quality printed images or, by the 1890s, numerous cheap imitations then flooding the market. The first postcard-style cards bearing seasonal greetings date back to about 1870, but the postcard as a popular mode of communication peaked during the early-mid twentieth century and millions of Christmas cards were produced in the modern format, including light-hearted novelty postcards. Photographic Christmas cards also became fashionable during the early-1900s, often picturesque, hand-tinted highly-posed tableaux representing Edwardian ladies with children decorating the Christmas tree or singing carols - or children dressed up as angels. A trend also emerged for families to have formal studio photographs of themselves mass-produced to send out at Christmas with a seasonal greeting: as late as the mid-late 20th century, photographs of babies and young children were slipped into folding pre-printed Christmas cards, especially for posting to far-away friends and relatives. The outbreak of the First World War in July 1914 increased the demand for cards to send to sons, nephews, brothers, fathers and sweethearts overseas at Christmas – a particularly poignant time for families and whole communities missing their menfolk serving abroad. Throughout the Great War many cards were posted back to Britain too, often printed with humorous images and patriotic messages, such as the cards commissioned by various army divisions for their men to send home to Blighty. Another significant genre of WW1 Christmas cards, highly-collectible today, is the hand-made embroidered card that contained a personal, often very moving Christmas message from a serviceman, to his loved ones at home. These special cards, known as WW1 Silks, were generally sold as souvenirs to British soldiers, having been hand-embroidered by French or Belgian women working from home or in refugee camps. Typically they bore embroidered greetings, as well as pictures of Allied flags, flowers and sometimes Christmas-themed emblems. Religious nativity scenes grew more popular during the early-mid twentieth century, as did images of fairies, cute children with pets and vintage-style cards recalling a nostalgic past, such as ‘Victorian’ street and country scenes. During the Second World War (1939-45), when most commodities were scarce and making economies became second nature on the Home Front, Christmas cards were often small and printed on cheap, flimsy paper. Soldiers serving overseas sometimes sent home pre-printed army-commissioned postcards containing a recent photograph of themselves – an intimate and reassuring way of keeping in touch across continents during the festive season.